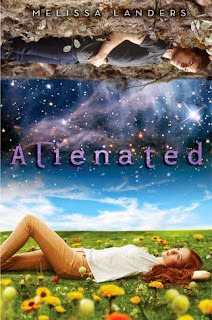 If you are as big of a fan as I am of the Lux Series by Jennifer L. Armentrout, then you will LOVE the Alienated series by Melissa Landers. Ever since the last book in the Lux series ended I have had this huge hole in my heart. Luckily, I found Melissa Landers Alienated and decided to give it a try. Now, it won't completely fill your Lux induced heartache, but it will definitely help. I absolutely loved this book! Two years ago, in the book's world, aliens made contact with Earth. In order to show that they came in peace they gave Earth a cure to cancer. Now they want to try and coexist. The first step is for 3 alien teenagers to live as exchange students on Earth with 3 different host families around the world. After one successful year the aliens will go back to their planet, but bring with them 3 human teenagers to live with a host family on their planet. The ultimate goal is to make it where Aliens and humans can coexist and create an alliance. The plan sounds simple, but there is always paranoia - especially when it comes to aliens inhabiting your planet. The comparison between Alienated and The Lux Series only goes as far as they both have hot aliens, there is lots of drama, and a romance. Other than that they are two completely different books. Cara is a little bit of introvert. She doesn't have too many friends, she isn't one of the popular girls, but she also isn't afraid to stick up for herself or others. She has this fearlessness about her. So, it's less like she's a loser and more like she just honestly doesn't care what people think. Aelyx is not only hot, but very moody. He doesn't want to be on this planet and he doesn't want the alliance to happen. He thinks humans will destroy his planet like they are doing their own, and he isn't afraid to insult them. The L'eihrs aren't naturally emotional. They are bred to not rely on their emotions, but it as actually becoming a problem, which is why the L'eihrs need the humans: to learn to feel again. What I loved the most about the story is that although they are completely different people, Cara and Aelyx find a way to become friends. Aelyx doesn't mean anything to Cara in the beginning, but because she is a good person she looks out for and defends him. Aelyx is the same way. For some reason he cares about Cara, even though he doesn't know what that feeling is. I love how upfront and blunt Aelyx is. I loved watching him speak his mind, and learn how to act from Cara. The entire story evolved so nicely, and I never felt like it was rushed. There is a short story between book one and two that I already read, which was fantastic, so make sure to also check that out. I cannot wait to read the second book! I absolutely loved this book. It is definitely similar to Jennifer L. Armentrout' Lux series so, if you loved that series make sure to check out this one. There are only a small handful of similarities between the two so make sure you don't go in thinking they will be exactly the same. I loved the character development and the relationship between Cara and Aelyx. I found them to be extremely lovable and I cannot wait to read the second book! Definitely check this book out!